Fiona and I have breakfast at the Tenby campsite and, on the way through the campsite, Fiona remarks at how many of the number plates of the cars are from the Republic of Ireland. 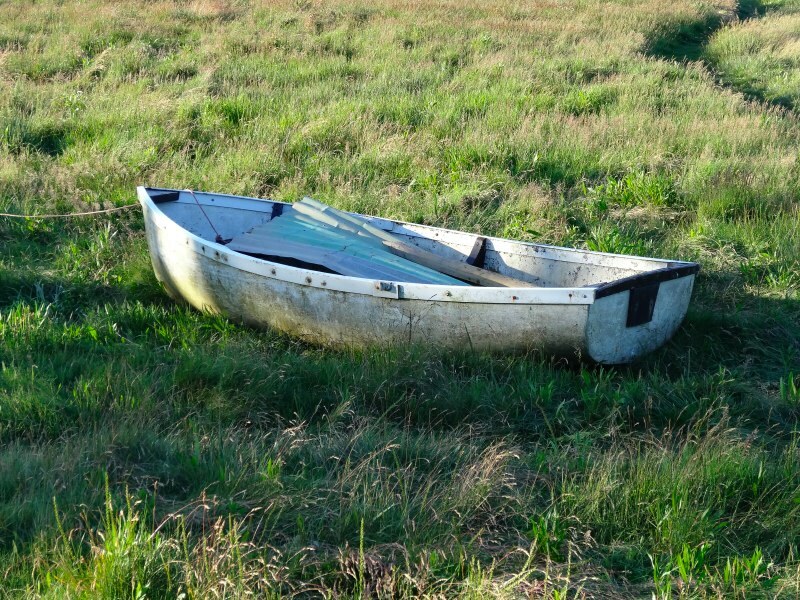 We assume they come over on the Cork–Fishguard ferry, but wonder at the sheer number given the wonderful coastline of Ireland itself. As we fill the van with water on the way back we meet an Irish family packing up themselves ready to catch the afternoon ferry, who tell us more. While there are plenty of beaches in Ireland there are no holiday parks such as this with planned activities for children. In fact they have not visited any of the coast around; they have a single daughter and she has been taking part in archery, airgun shooting and similar activities at the site. "Show her a Barbie and she wouldn’t know what to do with it," said her father. I am staying two nights at Laugharne for the first two days of Carmarthenshire, so drive the van there from my last ‘base’ at Tenby, and we write postcards while we wait for Fiona‘s bus to take her to Carmarthen and on her way home, and for the taxi to take me back to Amroth and the start of today’s walking. 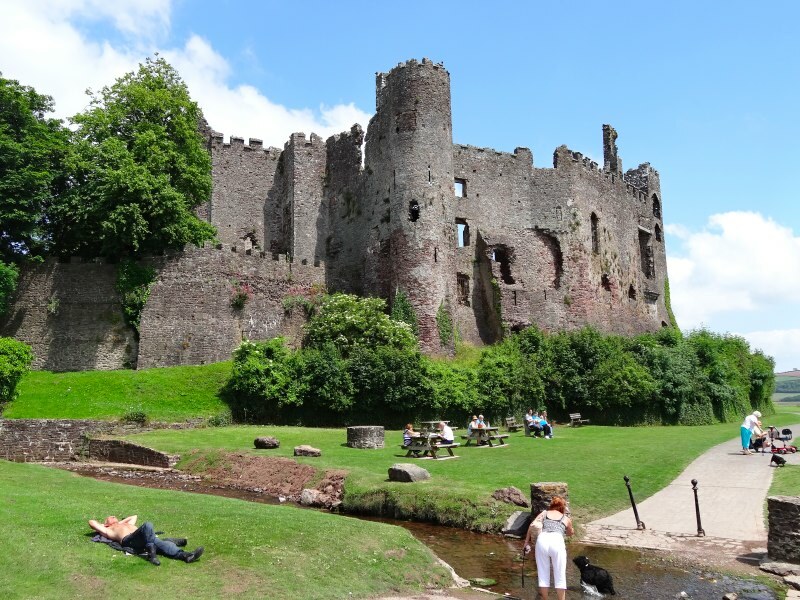 It will only be a half day, but just nine miles from the end of the Pembrokeshire Coast Path to Laugharne, and much of that (I thought) on road. As Fiona gets on the bus a passing woman shouts the score of the British Lions match to the driver; it is the last day of the Australian tour and the decider match. I ask him if he gets a running score at every stop. "Yes," he said, "I dropped a lot of the boys off earlier, and they said they would be on the one o’clock bus if things were going badly, or the three o’clock bus if they went well." 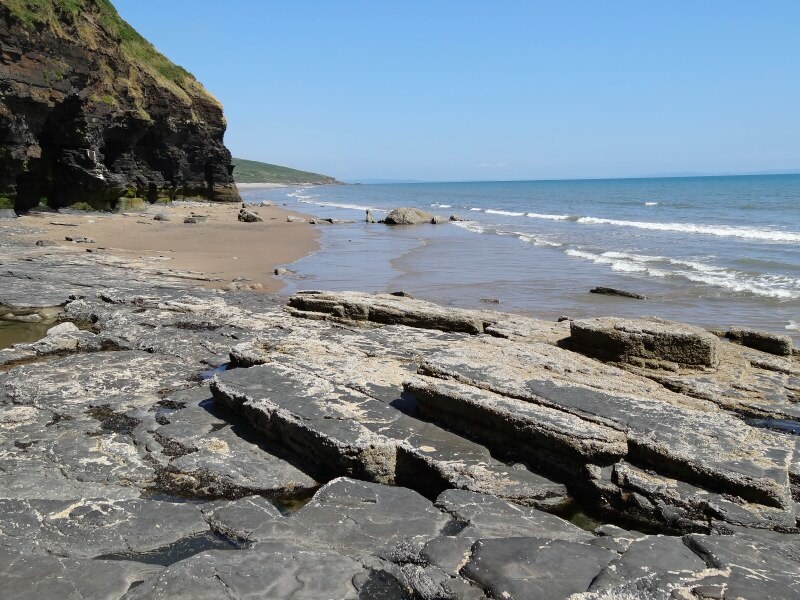 From Amroth, the path follows the road up the hill at ‘The Water’s Edge‘ and then along a grassy footpath above the cliffs, but then drops back down to nearly beach level, where a footpath leads down to the sands. 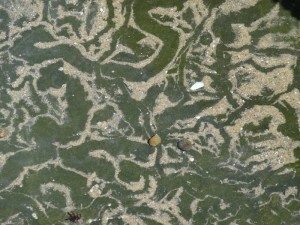 So, when the tide is low enough, as it was today, it would be possible to simply walk the length of the sands. 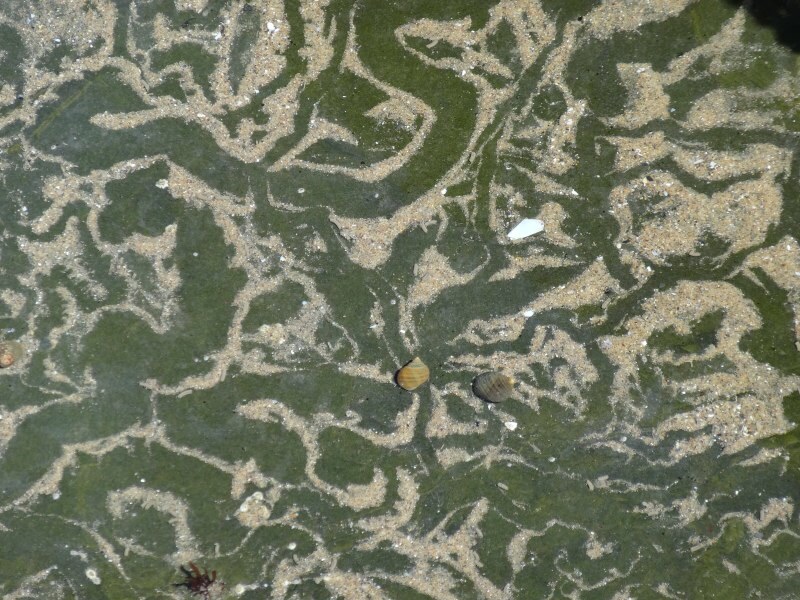 I always feel slightly cheated when I miss a beach walk. Having dropped, the path then rises again over another headland and then drops down again to beach level at a tiny rocky cove at Telpyn Point. It looks as if, with a bit of wading, I can walk round the next rocky headland and walk about a mile along Marros Sands. This is not marked as a possible route on the map, but I check with a walker coming the other way that it is possible to get from the Coast Path to the beach at the far end, and she says it is although she hasn’t done so as she was worried the tide was too high. From the east end it will be hard to tell if it is possible to get round the headland ahead, and a mile backtrack if not, but from my end I get the difficult bit first, so backtracking would not be a problem. In fact I barely get wet to my ankles, and if I had climbed across the rocks, probably not even that. Of course knowing you can get off a beach and finding where are two different things. Happily a couple are walking down the beach from that direction, so I ask them and they point out trees part way down the beach, where I will find a footpath pointing off the beach. When I get there I first find a tiny baby adder on the path; it does not move as I approach, so I think it may have died. I also realise that while this will connect with the footpath, in fact I can go a little further along the beach to where the Coast Path nearly meets the sea. Indeed, a few hundred yards on from the trees is another footpath post and this leads to two footpaths, each of which joins the Coast Path. From here it is another slow climb across the cliff contours, and then another drop down to a small sandy cove, between Ragwen Point and Gilman Point. 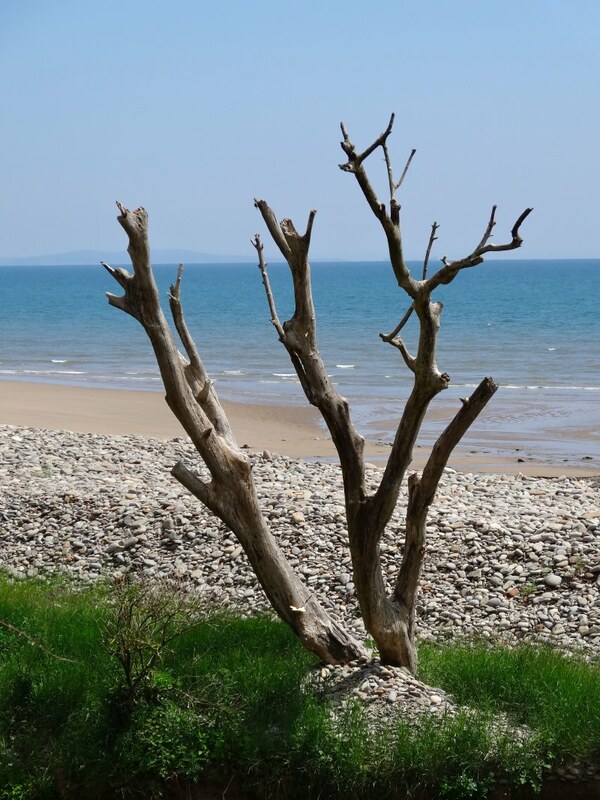 It is nameless on my map, but a sign says Morfa Bychan. 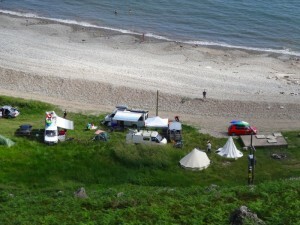 There is a narrow road leading down to it, and it seems to act as an informal campsite with bell tents, modern hoop tents, small and large campervans. A smell of wood smoke drifts up even when I am high on the cliffs. On the west side of the beach, perched perhaps twenty yards up the cliff, is a concrete structure with a pipe running out of it. 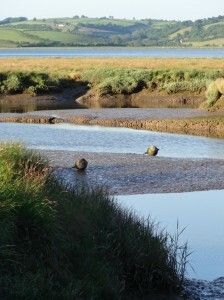 The map says ‘pumping station’, but I am not sure what it is pumping, maybe draining the marshland to the sea, but why? There is also a large rectangular block of concrete about thirty yards behind the pebble storm bar. It is the size of a long thin building, perhaps two static caravans end to end, but appears to be solid reinforced concrete. I write ‘reinforced’ with confidence as the seaward side is battered down in a number of places, almost like window holes, but just dents exposing the rusting steel reinforcement rods. If it had been wider, extending fully to one side of the valley, I might have imagined an old breakwater that had been rendered useless by a new storm bar, but it is too narrow and is just perplexing. 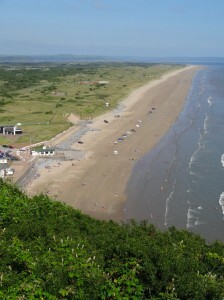 After this there is another climb for the last headland before Pendine. 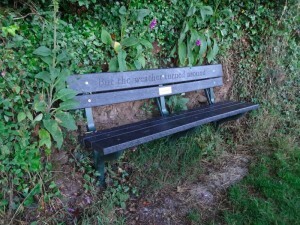 As the path does its final turn before descending into Pendine, there is a bench with views along the length of the sands. Another Alan is sitting there and advises standing on the bench to take a photo. He has just bought one of the static caravans in the site below and is looking forward to driving over for weekends here from Chepstow where he lives. He quizzes me about the walk as he has done both Offa’s Dyke and the South West Coast Path in stages. 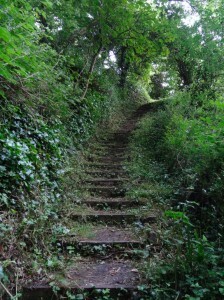 He also tells me there are 240 steps down to Pendine, he knows because he had recently come up them. Two hundred and forty steps later I stop at the Point Café, which the taxi driver recommended, and see a notice for Walk on Wales in the window. Alan had also suggested it was possible to follow the beach rather than the road as there were no red flags flying. 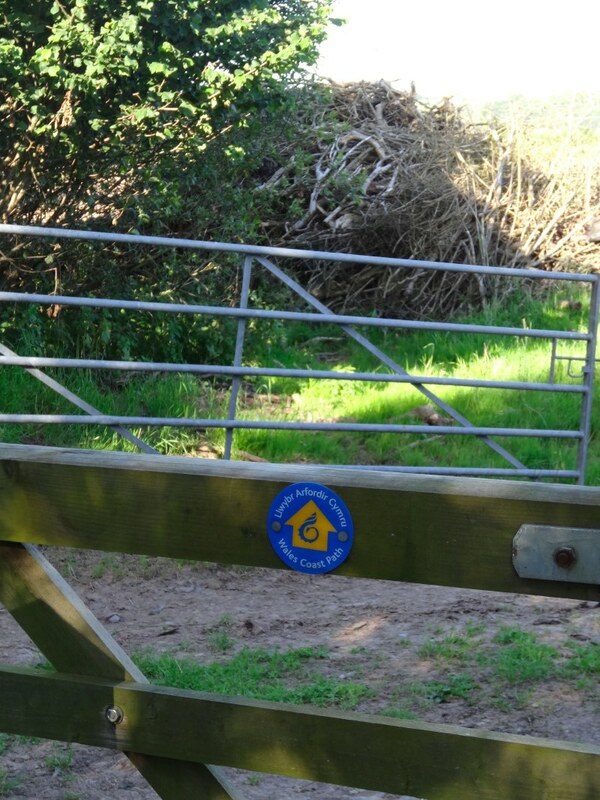 There is a footpath marked on the map that takes you back to the road but nearly all the way into Laugharne. It would be lovely to walk the beach as this is where so many land speed records were set and there is a ‘Museum of Speed‘ here to celebrate this. However, Alan has not walked this way himself yet and so doesn’t know whether it is easy to find the correct places to leave the beach. It would be a long way to come back if I don’t find the right place, and a lot of dune to get lost in if I take the wrong path, so I decide to opt for safety and speed and follow the road as it is the official path; a decision I will come to regret. 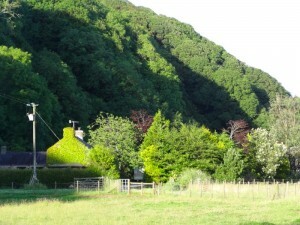 The Coast Path follows the pavement of the Laugharne road out of Pendine itself, and then through Llanmiloe, an estate of military housing on the outskirts of Pendine. 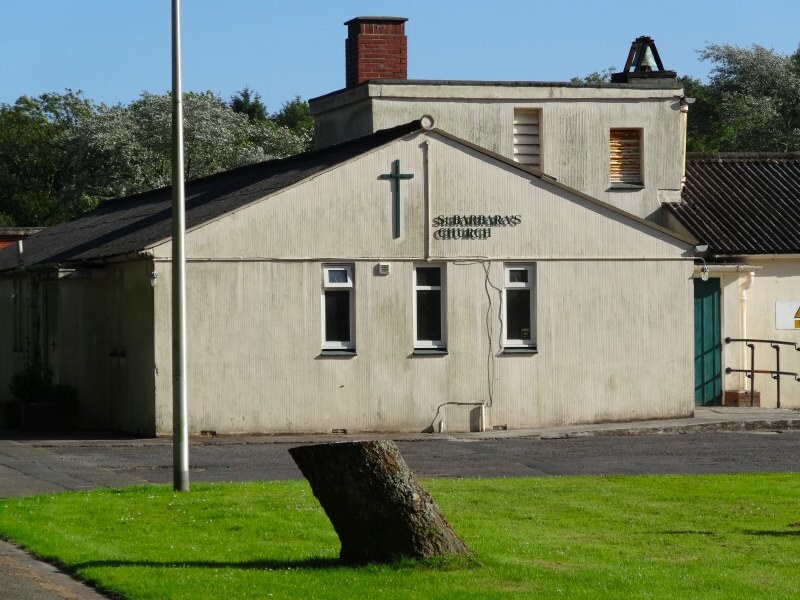 In Llanmiloe I spot the church of St Barbara in what appears to be some sort of ex-military building, swords into ploughshares, rock on! At the edge of Llanmiloe the pavement disappears and after a short while walking beside the road the path is signposted into the fields running alongside the road. I had been looking forward to the road stretch as I’d started late and thought it would give me a chance to catch up, but I followed the signs, partly because I try to follow the official path as closely as possible unless there’s a good reason not to, and partly as I don’t know the reasoning behind the route of the path; maybe this is an especially narrow and dangerous stretch. After about a half-mile or mile of this, the path runs along the edge of a ploughed field, squashed between hedge and churned earth. Ahead is an open gate and, after making my way over the furrows, I come to it. 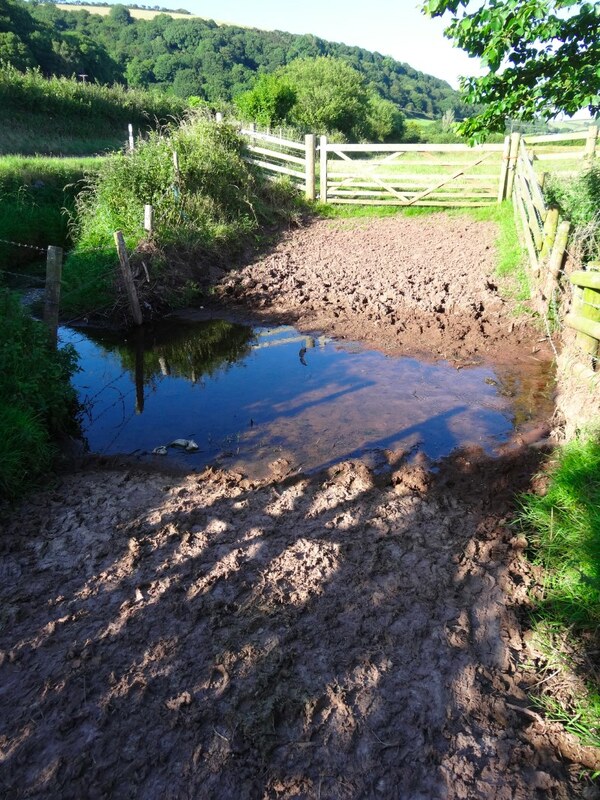 However, between this and the gate into the next field, a mowed or trodden grassy path beyond, is a ford across a stream, with no apparent way to cross except wading. The approach on either side is heavily cattle trodden, and flies fill the air above the gently moving water. There are no helpful stepping-stones, or plank to cross, but the water is only a few inches deep and runs clear and clean (even if the mud either side is not). So, I take the plunge, only the sandy bottomed ford turns out to be a slimy mud bottomed ford, and I sink up to my ankles. It could be worse. I am wearing sandals, so it is unpleasant, but less so than if it had been running shoes filled with muddy water, or boots, as I think the mud was higher than the waterproof level. Now on the other side I realise that the gate there is tied shut, and so have to cross back through the mud once again. I curse the Wales Coast Path and all who conceived, planned, or contributed to it. I fear a return to the trackless routes I met in North Wales, and, not for the first time, the path reduces me to tears. My relationship to the Coast Path has become like family. I have a great loyalty and I guess love for it, but also can rail at it. As a boy, I would often complain about my Mum to Martin, my best friend, but once, when he said something critical about her, something I might well have said myself, I was indignant. Having vented my frustration to the empty fields and furrows, I went back along the field edge, and looked once more at the Coast Path arrow on the last stile, which so clearly pointed along the field edge and towards the miry ford. Shaking my head at the perversity of the path, I follow instead the road, resolving to do so and ignore the parallel field paths. However, my indignation was somewhat tempered when I passed the dreaded ford, and from the road could clearly see, no more than five yards further on, a small wooden bridge with a Coast Path sticker on it. If I had simply taken a few steps along the field boundary, away from the road, I would have found it. I still don’t know how I missed it despite looking back when I rechecked the arrow at the previous stile. I guess it was perhaps partly hidden by the hedge and I was walking very close to the field side because of the ploughing. So while something went seriously wrong with the signage, they had not intentionally led me into the mud! As I said, the Coast Path has become like family, and despite being let down by it, I gave it yet another chance to make amends and at the next chance left the roadside and once more followed the field paths. 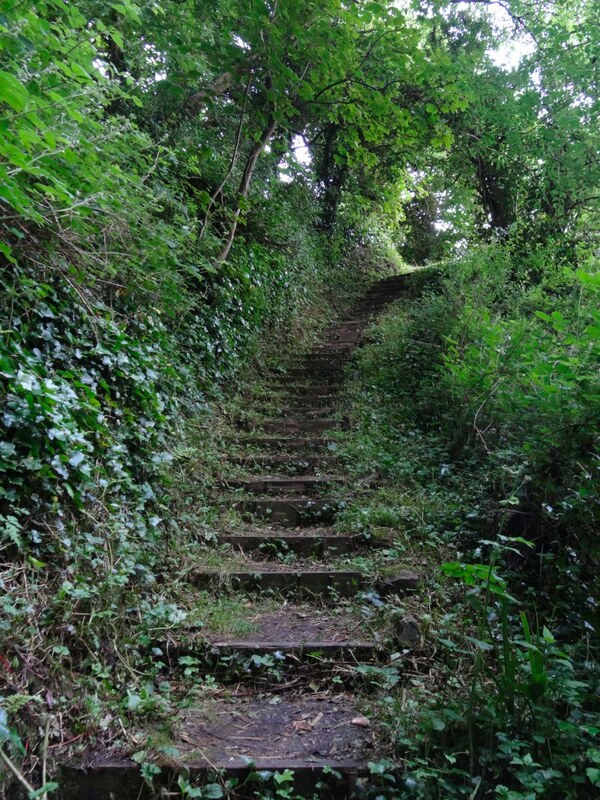 Eventually, when the fields gave way to a wooded hill, the Coast Path arrows led back on to the, now wide, road, and then, not long after, turned right away from the road, to follow lanes and farm paths between hill and flood plain. For the final approach into Laugharne, the path mounts the hillside, where, I guess, the mud of the estuary cuts too close to allow a path. Indeed, from one of the information boards I find that this path over the hill was made by the local corporation to allow the people of Laugharne to access the cockle beds on the far side when the tides made it impossible to go around. 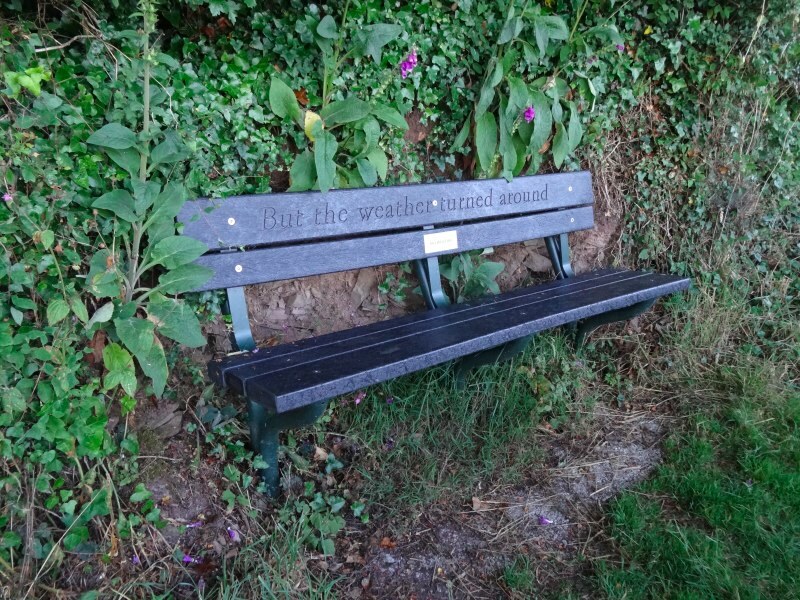 It is also now known as the Dylan Thomas Birthday Walk, as it was here he composed a poem about his thirtieth birthday, and on the benches as you go past are lines from the poem. Finally, I get to the town quay and head for the Culture Café, which had been recommended by Jackie, the landlady at the Stables. Culture Café is an Italian/Mediterranean-style café, although Amir, the proprietor and chef, is not Italian, but, I think, of Middle Eastern extraction. I had a carbonara. These are often disappointing in the UK as it often simply means pasta in a cream sauce, but I decided to give it a try. It was a good choice, not like an Italian carbonara, but neither like the typical British one; delicious, but in a very individual way. The lady who serves me is wonderfully welcoming and interested in the walk, so I give her a few leaflets. It turns out she is from Syria and she is clearly feeling deeply the suffering there. As I arrived late, I am one of the last to eat that night. Towards the end of the evening Amir comes out to talk to a neighbouring table. They are staying in Laugharne, and after coming here one evening for a meal had then come every following evening and for breakfasts as well! After they leave, Amir tells me a bit about the restaurant and his philosophy as entrepreneur and chef. 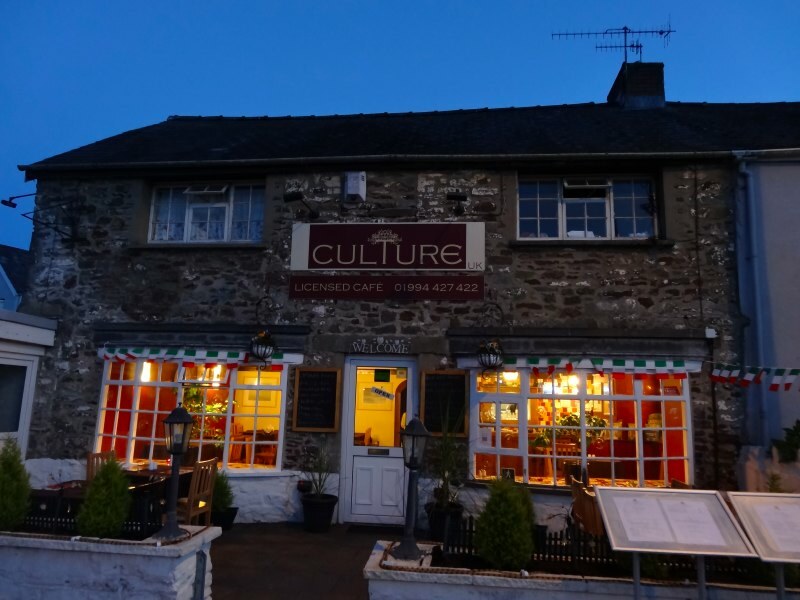 He already had a café in Whitland, a town nearby, but wanted to push his boundaries and start something a little different. Before starting, he spent time visiting Italian restaurants, going into the kitchens, talking to the chefs, keeping notes and learning. He takes the quality of the food very seriously. That evening, he said, he had prepared two lasagnes, but they were not cooked to his satisfaction, so he threw them away and started again. It is better that they wait a little longer for the food, he told me. It is not just the food he cares about, but also that he creates a business that is fair and welcoming. "I talked to a chef who looked through my menu and he told me I should charge more for this, and less for that," Amir said, "but I didn’t do it. I work out how much it costs, what I need to pay for the restaurant and the staff, and a small profit and that is the price." It is clear that this business approach based in fairness, not making the most out of each customer, pays off, as his custom is growing fast. However, maybe customer is the wrong word. "They are not customers," he says, "they are guests". I am sad to leave, but it is getting late and it is dark outside. As I leave Amir says, "if you come by and we are closed, just knock and we will open for you." 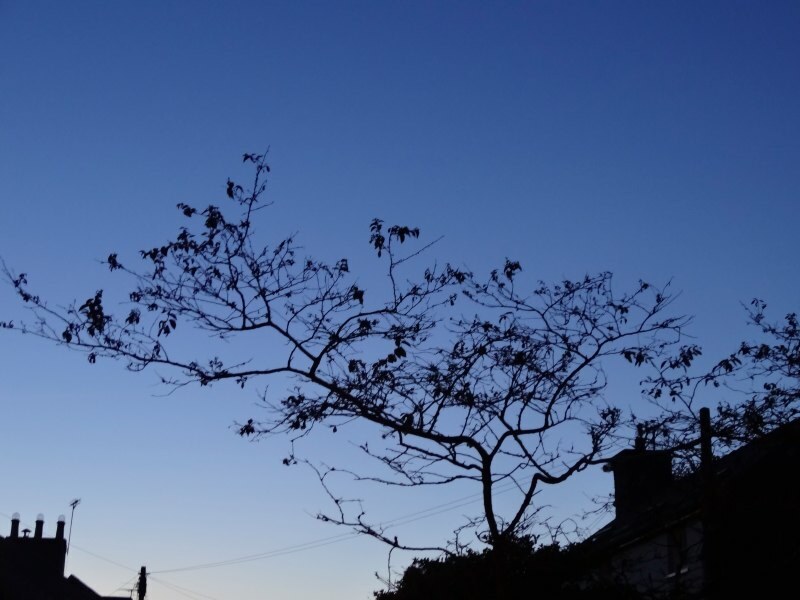 I walk slowly back through the streets of Laugharne, past the old lock-up where a voice speaks out of the darkness, the automated system Harold Thimbleby had installed a year or so ago. A small group of men, somewhat worse for wear, chat for a while and tell me I should visit one of the pubs where the barman is from Cardiff, but it is already late and instead I make my way back down the pitch dark lane to the Stables and sleep. 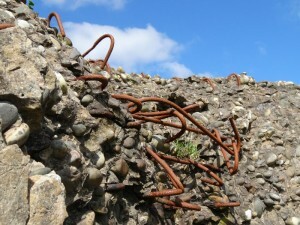 I believe that this structure is a defence against tanks dating from WW2. I read your account of the walk from Pendine to Laugharne since I had concluded from the route maps that much of it was on the narrow and busy road. I had intended to walk this section, but I regarded it as too dangerous. It seems from your account that there is an alternative to walking the road, albeit not well signed. Can you confirm this please? Sorry Robin, been away a bit and not checked the blog. Yes for most of the length there are sections running beside the road just into the fields. When I walked it (early July) the road did not seem to busy anyway. I lived in Pendine in the 60s when my father was a manager of the rocket and ejector seat trials there.. morfa buchan was used for mock beach landings pre d day. and for testing equipment hence the slabs. the water is pure and is pumped in to the water system of Carmarthen or it was…. thanks, that all makes sense now. I had no idea either the ejector seat trails at Pendine, just the use for land speed records.